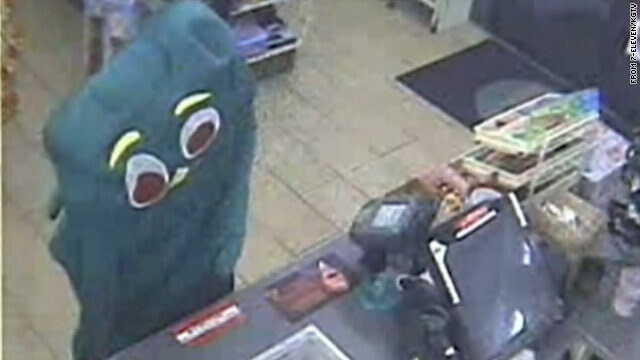 Surveillance video shows Gumby at the counter of a San Diego-area 7-Eleven on September 5. It's up to the San Diego County district attorney, San Diego police say. But they are confident they've got the character suspected in the attempted robbery of a 7-Eleven store early on September 5. 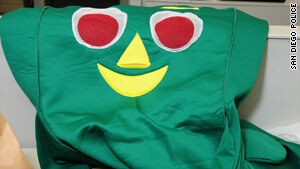 Police say this Gumby suit was turned in on Tuesday. Surveillance video from the convenience store shows the human-sized figure, dressed as the beloved Claymation character, entering the store with his arms raised. He pounds on the counter and demands money from the clerk. Then he reaches into his pockets, presumably for a weapon, but only drops change on the floor. After trying to pick the coins up - unsuccessfully (hint, hands like mittens) - Gumby leaves, joining an accomplice who'd left the store earlier and was honking the horn of a waiting minivan. San Diego Police Detective Gary Hassen said Wednesday that Jacob Kiss, 19, turned himself and a Gumby costume in to police on Tuesday. Also surrendering to police Tuesday was Jason Giramma, 19, who was not dressed as an orange horse, but who police allege was an accomplice in the 7-Eleven stickup. Hassen said it was the human face of Giramma, rather than the widely recognized green mug of Gumby, that provided the big break in the case. "We got the video out and we figured that somebody would recognize his accomplice," Hassan told CNN. Tips came in through Crimestoppers, he said, and the cops soon had their TV character. A call to Kiss followed. "You and Gumby need to come in Tuesday morning. We'll sit down and have a polite conversation," Hassen said police told the suspect. Hassen said the case has been turned over to the district attorney, who'll decide what course a possible prosecution could take. Meanwhile, the Gumby caper has attracted worldwide attention, Hassen said, drawing media inquiries from as far away as Australia and Japan and showing up on "The Colbert Report" and "The Late Show with David Letterman." Hassan said among high-profile cases, it's one of the top three in his time in law enforcement. One person who might find all the notoriety a bit strange is the 7-Eleven clerk who was the victim of the alleged robbery attempt. He didn't even think it was a serious holdup attempt, and police were not called until the store's manager came in the next morning, nearly six hours after the incident, CNN affiliate KFMB-TV reported. Of course, he also said he didn't know who Gumby was, describing the assailant as a green SpongeBob. @banasy: No duh. You went right over my point. @cja: many people get hysterical in situations like this, it doesn't mean the cashier thought it was funny or didn't believe it was a hold up. The same thing has happened to bank tellers when they've had gun threats. @banasy: that was an astute observation, you win the captain obvious prize of the day. Funniest line...Will Gumby end up in the Pokey? Maybe it was Eddie Murphy "I'm Gumby Dammit!" Mr. Gumby is innocent. Release him. Couple of village idiots. I'd tell both of them to enlist or go to jail. Nothin' wrong with those two that a stint in the Army wouldn't cure. Gimme yur money. I'm GUMBY, dammit. What would you do if someone does that to you? I'll just get his name and address and hang out for a while (If he wants too).